The Firefox address bar, also known as the awesome bar has URL suggestions and auto-complete enabled by default. That means, when you start typing a URL in the address bar, a list of recently used URL that best matches what you are typing appears as a drop down menu. The auto-complete feature automatically completes the URL you are typing with the best match. This is the desired way most people would want Firefox to behave. Of course that also means any body sitting next to you while you are typing a URL will be able to see a part of your browsing history!!!! So if you are among those who value privacy to a higher than normal level, here's a cool trick. 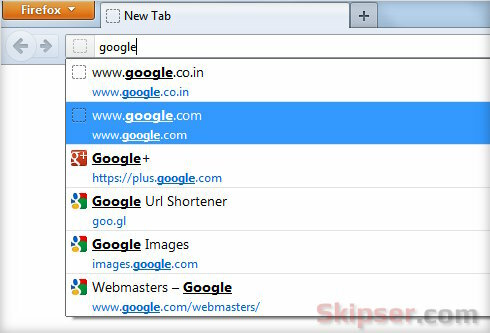 1.Disable URL suggestions in Firefox. Type about:config in the address bar and click on the "I'll be careful" button. Type "auto-complete" in the search box. From the preferences that filter out, Double click on "browser.urlbar.autocomplete.enabled" to change its value to "False". That's it, you won't see any suggestions coming up when you type a URL in the address bar. 2. Disabling auto-complete in Firefox address bar. Type "autofill" in the search box. From the preferences that filter out, Double click on "browser.urlbar.autoFill" to change its value to "False". I set Firefox to delete all of my History when I close it, but it is obviously still storing sites I have visited in order to suggest/complete them later. I want to clear THAT data as well and prevent it from being captured, not just disable this specific use of it.